My colleagues and I went to Ying Jia at OUG (Phobie’s family restaurant) for dinner. 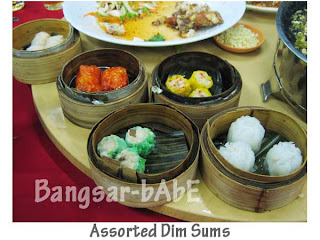 They serve dim sum in the morning and tai chow and steamboat at night. We didn’t order the steamboat, but Phobie invited me to take a picture of her dinner. 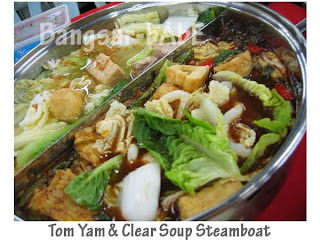 And I scored a bowl of tom yam after that…kekeke. 😛 She prepared 10 dishes for us to try. First up was the Fried Talapia with Homemade Sambal. 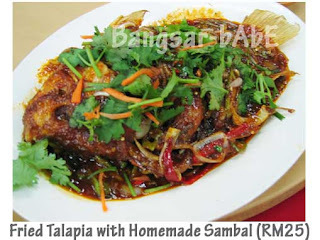 The fish was deep-fried till crispy and topped with spicy and tangy sambal sauce. 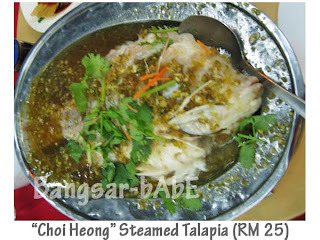 Not bad, but it was the “Choi Heong” Steamed Talapia that stole the show. With no fishy smell or taste, the sweet flesh is flavoured with ginger & preserved vegetables gravy. Very delicious with rice. Next up was the sliced pork with salted fish, better known as “Ham Yue Fa Lam Po”. 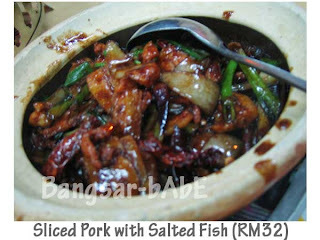 Rich in flavour, the tender pork slices were cooked in caramelized black sauce, and the dried chili added gave it a “kick”. If they had added some salted fish pieces in the dish, it would have been better. 😉 We tried 5 baskets of dim sum too. Nothing spectacular, but quite reasonable. I think it’s RM 2.50-2.80 per basket. The Fried Chicken with Ginger was quite nice. The ginger seasoning gave the chicken pieces “heat” which was lovely with rice! A very homely dish. The Ming Prawns with Minced Onion came soon after. The deep-fried prawns were fresh and juicy. Topped with minced onions and chili padi, it was not bad. 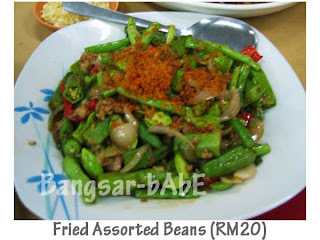 I didn’t try the Fried Assorted Beans as I’m not a fan of petai. The others who ate it said it was alright. The Sheong Thong Lala was quite decent. The clams were big, sweet and juicy. They added kei chi in their gravy which went down well with the gang especially Michael, who was fighting for the gravy. He even used the saucer to hold the gravy. I thought the gravy could use more rice wine and ginger, but it was still good. 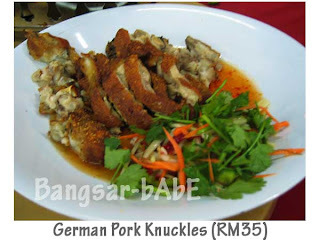 The German Pork Knuckles was average. While the skin was crispy, only some part of the fats melts in your mouth. 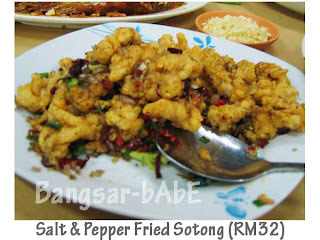 The Salt & Pepper Fried Sotong was delicious!! Bouncy, succulent squid rings deep fried in light batter seasoned with salt, pepper, chili bits and some curry leaves, it was really moreish! Damn shiok with cold beer! The crabs arrived last. 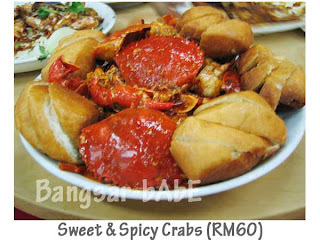 I liked the Sweet and Spicy Crabs. Served with deep-fried mantau buns, the gravy was full-bodied and thick. I enjoyed mopping the gravy with the fluffy mantau buns. The crabs were sweet and fresh too. 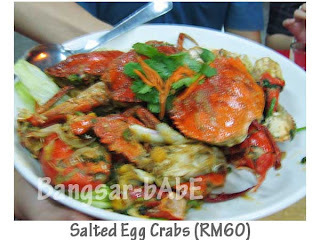 Their Salted Egg Crabs came with spring onions…which was different from the usual. It gave the dish an interesting twist…and best of all, it was not cloying. We had 10 bottles of Carlsberg and countless refills of Chinese tea. Dinner cost RM 585 for the 15 of us. (RM 39 per person) All in, dinner was lovely and the company was great. I’m looking forward to trying their special butter noodles and kam heong lala. Verdict: Home cooked-style food at reasonable prices. Try their deep fried squid and Steamed Talapia. wah thats alot of food..but wait..theres alot of ppl too!..brilliant chance to snap plentiful of pictures! I wouldn’t say brilliant chance la…cos I had to stop them from poking their forks into the dishes! 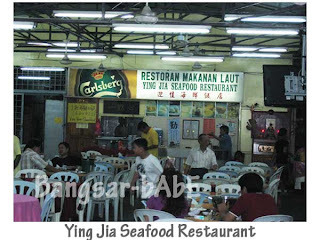 yeah ying jia has always been a good place to eat, the ginger chicken has been my all time favorite. 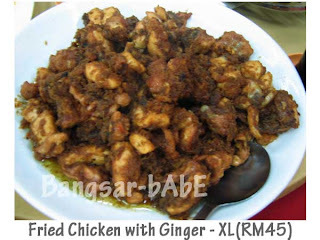 The next time u go there, ask for the butter chicken, thats fantastic as well. 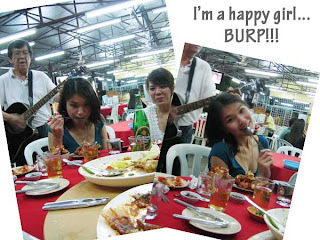 yes..if u eat with food bloggers ar..hahaha plenty of “foreplay” with the pictures!